Is Heroin Addictive? How Addictive is Heroin? Two decades ago, heroin was the drug du jour, with designers capitalizing on the hollow-eyed appearance it yields in their "heroin chic" marketing campaigns. Now, heroin addiction is yet again on the rise, with the rate of first-time use increasing by a stunning 60% over the last several years. Heroin may be the world's most addictive drug. While all mind-altering substances can nurture a powerful physiological dependence, heroin is notoriously challenging to quit. The symptoms of withdrawal are so intensely uncomfortable that they lead many heroin addicts to resume use of the drug to postpone their onset. Many attempting to quit heroin must try multiple times before they finally kick the habit. Reports point to as many as 23% of heroin users developing a full-fledged addiction. Some even become addicted to it with their first dose. Heroin addiction affects not only your mind but also your body. Many users experience weight loss or suffer from headaches, muscle spasms, and other painful symptoms when they can't use heroin. Find Treatment Now It's never too late to recover. If you see these signs in yourself or another, seek treatment. Find a recovery program now. Endangering yourself to buy or use heroin. Doing things you regret while under the influence of heroin. Being unable to stop using heroin, in spite of your best efforts. 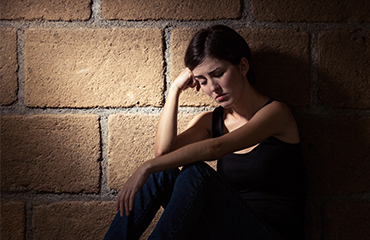 Changes in your mood or behavior; many heroin users experience apathy and depression. If you're concerned that you might be addicted to heroin, take that concern seriously. Addiction will do just about anything to maintain its control over your life, and denial is common among addicts. Are you still using in spite of negative consequences? Do you experience drug cravings or symptoms of withdrawal when you attempt to quit using? If you answered 'yes' to any of these questions, you've probably become dependent on heroin. Endeavor to make getting sober seem like the obvious and easier option by, for example, refusing to give your loved one money until he seeks treatment. It might seem like getting an addict into treatment should be easy since heroin offers no benefits. But addicts are often in a deep state of denial. Moreover, the pain of drug addiction--and the shame it brings--encourages addicts to refuse offers of help. 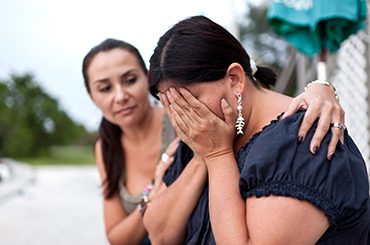 If you want to help a loved one, avoid shaming them or telling them they're a bad person. They already feel terrible enough. Instead, offer support to help them get clean, and then encourage them to seek treatment. Ultimately, no one can make an addict get sober. That's his or her choice to make. By setting clear boundaries and offering your loved one support, though, you protect yourself from their addiction while simultaneously showing them how important their sobriety is to you. Heroin addiction is all-consuming and watching a loved one lose their life to heroin is a frightening prospect. But remember, you are not alone, help is available 24/7 at 1-888-993-3112Who Answers?. If your loved one has ignored your pleas to seek treatment, then it might be time for an intervention. An intervention offers your loved one the chance to seek treatment or face the consequences of not doing so. 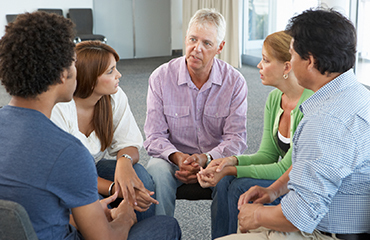 The process begins with a group of people who love the addict - people who recognize that he or she needs treatment, and who are committed to setting clear boundaries if the addict refuses treatment. Share how their loved one's addiction has touched their lives. Outline what they'll do if the addict refuses help. The intervention ends when the addict is presented with the choice to seek treatment. If the addict agrees, he or she will go to treatment soon after the intervention. But if he or she is unwilling to seek treatment, each member of the group will be responsible for setting clear boundaries. The key here is to follow through with your promises, thereby making treatment seem like the obvious choice--not to mention the easier one. Heroin can turn your loved one into someone you hardly recognize. Many heroin addicts lie to and steal from loved ones in a desperate attempt to get more drugs. Others simply disappear, and some even become abusive. You don't have to face the challenge and melodrama of loving an addict by yourself. Support groups such as Nar-Anon can help you protect yourself while still loving and supporting the addict in your life. Inpatient Treatment. The pain of heroin withdrawal means that it's very difficult to quit heroin without comprehensive support. Inpatient rehab offers precisely this, providing therapy, medical care, 12-step programs, and a host of activities to keep your mind off your cravings. The major benefit of inpatient treatment is that it takes you out of your everyday environment and the temptations associated with it so you can focus on recovery without distraction. Luxury and Executive Facilities. If you're concerned that rehab will be a miserable experience, you might want to look into private luxury facilities. These facilities blend the best treatment options with a luxurious and comfortable setting. With such a program, you can get sober and take a vacation at the same time! And if you're concerned about how rehab might affect your career, consider an executive program. These programs blend the comfort of luxury rehab with the practical considerations that busy professionals need to thrive in their careers. You'll have access to meeting rooms and a business center, not to mention a chance to work even as you plod toward sobriety. Outpatient Treatment. If you've already completed rehab or want to give sobriety a go without rehab, consider a partial hospitalization or intensive outpatient treatment program. These programs offer services similar to those you'd get in rehab, but you'll go home at the end of each day. For a less intrusive option, you can also pursue outpatient care in the form of therapy, 12-step programs, medical detox, or the help of a supportive physician or other addiction treatment professional. Generally speaking, outpatient care is most effective when you try several approaches at once. The effects of heroin addiction can leave you feeling beaten down and defeated, but you didn't ask for this problem, and you don't deserve it. Taking the time to research your treatment options is one of the best gifts you can give yourself, not to mention a great way to avoid spending money on programs that don't work. Follow your instincts, and be sure to ask for references. And if the person or facility you've chosen is unwilling to answer your questions, move on. Heroin addiction recovery is not only possible; it's common! Thousands of heroin addicts have kicked this dangerous habit, and you can, too. No heroin treatment plan is perfect; but you can find one that meets your needs perfectly; for more information on how to beat heroin addiction with the right treatment, please call 1-888-993-3112Who Answers? to speak to a treatment support specialist.